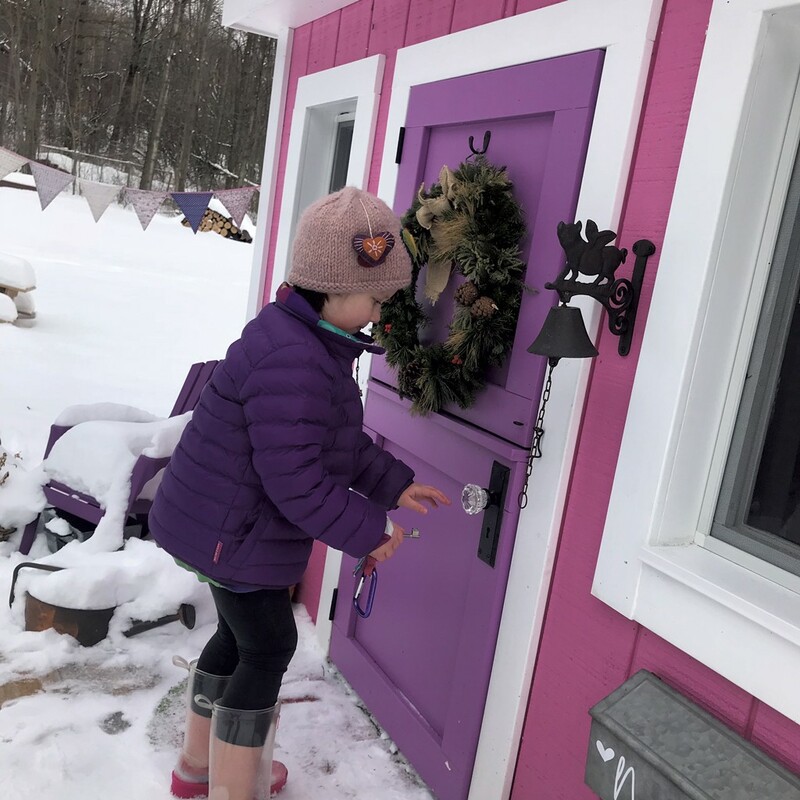 Habitat: The Little Pink House | Habitat | Kids VT - small people, big ideas! 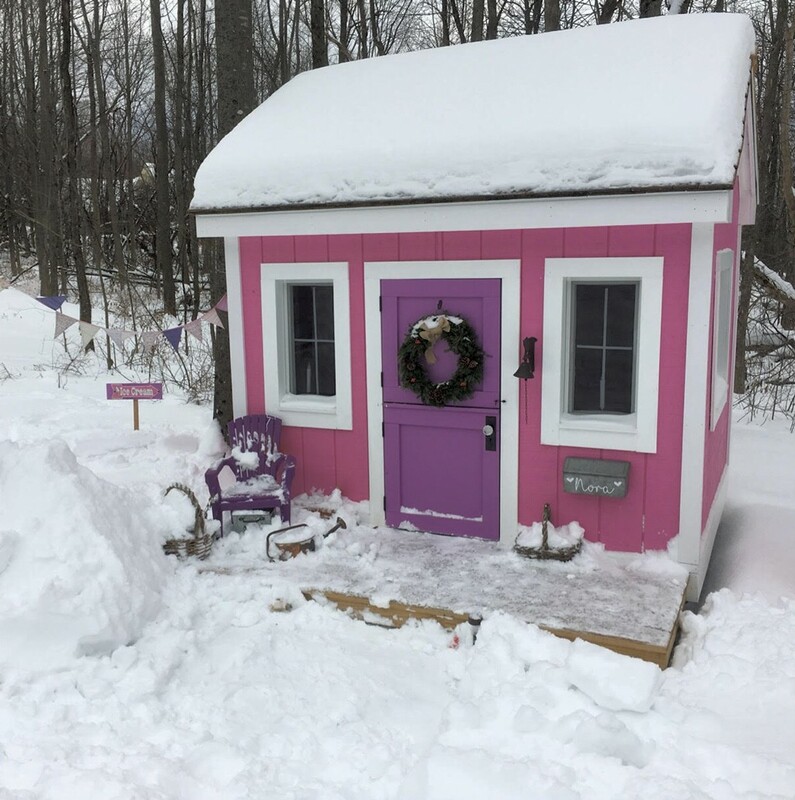 When Jamie Cudney's husband, Ken, began building a structure in their Hinesburg backyard in the fall of 2016, neighbors were curious. When they asked what it was, Jamie told them to wait and see; it would be obvious soon enough. Once the paint — in a cheerful shade of bubblegum pink — was applied, the neighbors caught on. It was a playhouse for the couple's youngest child, Nora, now 4. Ken, a pharmacist with a knack for carpentry, built the 48-square-foot house from his own imagination, without any formal plans. It was, Jamie says, a "complete labor of love" for their daughter. Ken included sweet details, like a split Dutch door, pink window knobs, and a cast-iron flying pig bell. A large window boasts chalkboard shutters that open out. 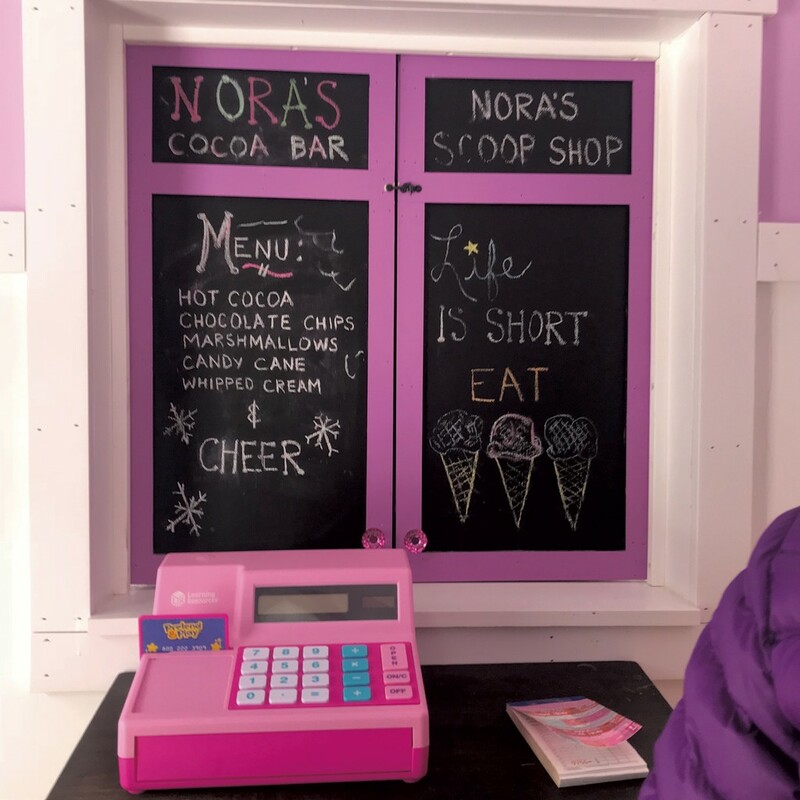 Those shutters became a menu board earlier this winter, when the family hosted "Cocoa for a Cause" to help their 11-year-old son, Cole, raise money for Special Olympics Vermont. About 60 customers showed up on a Wednesday afternoon in January for hot chocolate with all the fixings — chocolate chips, marshmallows, candy canes and whipped cream — served from the playhouse window. Last April, Nora dished up ice cream with sprinkles for her friends out of that same window at her fourth birthday celebration. And for middle child and Little League enthusiast Sawyer's baseball-themed ninth birthday party in June, the playhouse became a ballpark concession stand. Attendees were each given four quarters to spend on 25-cent snacks, including popcorn, chips and Big League Chew. Family pictures hang in frames on the interior walls of the house. A small lavender table in one corner serves as Nora's art station. 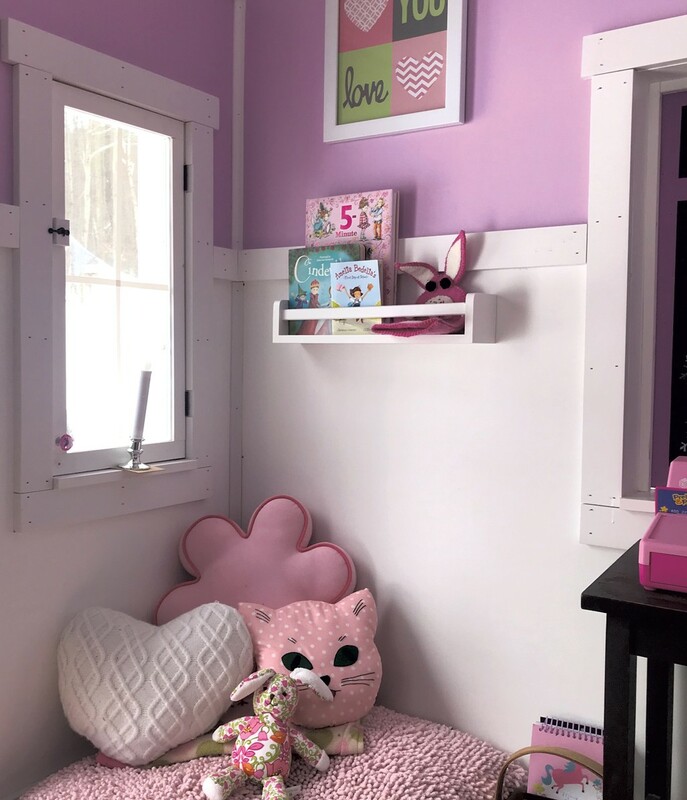 In another corner, a shaggy pink floor pillow and a hanging bookshelf create a cozy reading nook. A pink play kitchen, chalkboard with magnetic letters, cash register, and a baby doll in a car seat create more opportunities for imaginative play. And the play mop from a Melissa & Doug cleaning set does real work when the pine floor gets slippery from snow. Well aware that a playhouse can quickly be outgrown, Ken built the structure tall enough for adults to stand up in. Jamie and Nora spend mother-daughter time there reading together, and there's talk of a playhouse campout when the temperatures rise. Nora even welcomes pets. She lures the family's Golden Lab, Cinnamon, into the house with dog treats kept inside. The Cudneys got cedar shingles for the roof for free from the Hinesburg Front Porch Forum. The finished wide-plank pine boards on the floor of the playhouse are leftovers from a friend's remodeling project. The pig bell is from Amazon. The house's exterior is painted Behr Raspberry Pink. The door's shade is Behr Heart Potion. Inside, a hanging lantern — a birthday party favor — filled with a strand of LED lights provides a (dim) overhead light. Jamie snagged the art table and play kitchen from a Facebook swap group. A metal mailbox with Nora's name written in cursive holds notes from neighbors and cards from grandparents, secretly transferred from the real mailbox by Jamie. Ken estimates the playhouse cost approximately $2,500 to build and furnish. It took him from October 2016 to June 2017 to build, with a break for winter weather.